Door, Window, Floor, Air Conditioner, Heater, Lighting Etc. 1. Easy to be assembled and dismantled, movable. 2. No pole inside, 100% available interior space. -30 degree Celsius to +70 degree Celsius. other optional items like air conditioner, heater, floor, window, lighting etc. event, party, wedding, trade show, car park, restaurant, church etc. 1. Specialized in producing dome tent : dome tent is our main product . We specialized in producing many styles of dome house , especially large size dome tent . 4. Good quality after sales service : we can supply easy understanding assemble instruction and drawing for you to instal the tent . if needed , we also can send one technician to guide the installation FOR FREE. 1 . Fabric cover : 850g / sqm dual blocked-out sunshine PVC coated polyster fabric . 100 % waterproof , fire retardant ( DIN4102 B1 ) , M2 , CFM , UV resistant , tear resistant , self - cleaning ability . Besides PVC coated polyster fabric , the fabric cover can be white or colourful PVC , TPU or mixed together to make the dome tent in different design and style. 2 . Structure : diameter 42mm , 3mm thickness , hot dip galvanized steel pipes . Zink coated thickness is at least 60μm . Hot dip galvanized is the best anti rust treatment way for steel , better than electric galvanized . Hot dip galvanized steel can withstand the severe environment , such as salty air near the sea , moist air in the forest etc . 3. Footing : Hot dip galvanized steel parts , and used to connect the steel pipes and ground . On concrete floor , we use expansion screws to fix the bases with floor . On soft ground ( grass ground mud ground ) , we use big steel nails ( anchor ) to fix the bases with ground . On undistructible ground ( marble , asphalt ground etc ) , we use weight plate system to fix the bases with ground . 4. Door : Glass door . Durable , strong , luxury . There are other doors for optional , single swing aluminum frame tempered glass door , metal door , PVC zip door etc . Price is different . A. 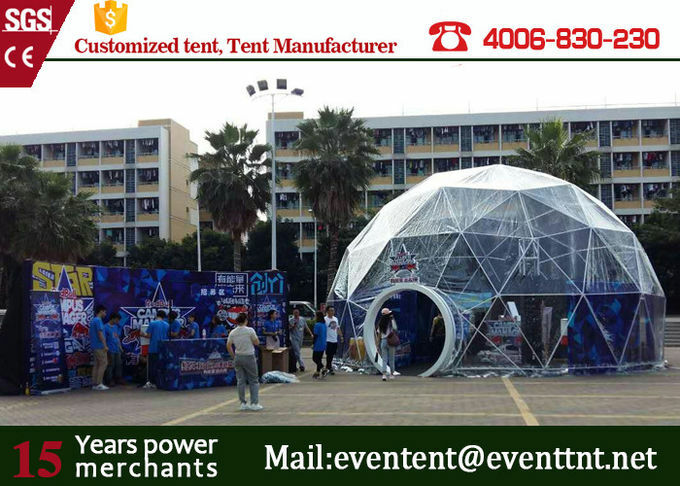 Sports Event , after make enough ventilation holes and windows on the tent , the large dome tent can be used as gymnasium . the room space is big and no posts inside , can be made use of 100 % space . B. Wedding party ; we can design the large dome tent into many styles according to the wedding party theme . To make the large dome tent suite the different style wedding , different types of party and make the party full of happy atmosphere . C. Hotel ; after equiped with insulation lining , decoration lining , floor system , furniture etc , the large dome tent can be used as a comfortable outdoor hotel . 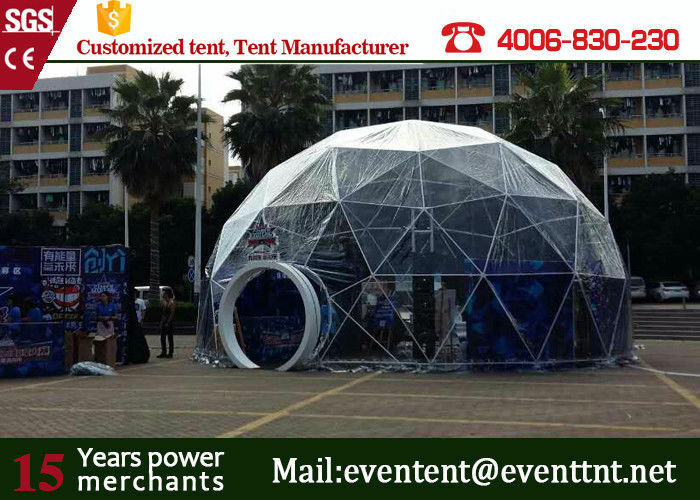 Large dome tent is special with its shape and style , it can attract the eyes of everyone who see it . D. Trade show ; as the large dome tent has no posts inside , can make use of 100 % space , can set many trade booths inside the tent . E. Restaurant ; the large dome tent can be used as any style restaurants . With special style and design , with luxury decoration , the large dome tent restaurant will have many visitors every day . Create with the heart , Build with the mind! 5. Other Optional Items: draping, table, chair, lighting , A/C, carpet , installation tools etc. A. If fix on concrete floor, can use expansion screw, no extra cost for the screw. B. If fix on earth (lawn or sand), need big steel nail, and need extra cost. C. If fix on the floor that can't be damaged (such as wooden floor, marble, ceramic etc) , need loading system , and need extra cost . The steel structure & fabric cover are packed sperately to make shipping load . The steel structure is packed in steel frames . The fabric cover is packed in pallet .